The other day while shopping at my favorite Sam-Mart-Club I ran across a sweet deal on Meyer lemons, 2 lbs for 98 cents! It was way too good a deal to pass up. But then I was stuck with the dilemma on what to do with them? After a few days of contemplation I ultimately decided to pair the Meyer Lemons with a Cornish Game Hen and my Green Chile Rub. Meyer lemons are a cross between a lemon and an orange. The skin is thin like an orange and it’s not quite as sour as a regular lemon. Their flavor is citrusy with essence of lemon, very tasty. 4 – 6 Meyer Lemons. In a large bucket or stock pot add the apple juice, sugar, green chile rub and sugar and stir till the salt and sugar has dissolved. Submerge the hens in the brine. Cut 2 of the lemons and squeeze the juice into the brine, then toss the squeezed lemon into the brine as well. Cover and refrigerate for at least 4 hours, overnight is best. Remove the hens from the brine and pat dry. Coat them with a light coating of olive oil and season with AlbuKirky Seasonings Green Chile Rub. Cut a lemon into quarters and place one quarter in the cavity of each hen. Set up the grill or smoker for indirect cooking and heat to 300-350. Cooking time for the hens is about an hour, maybe a little more. Just be sure to temp the breast and thigh and the internal temperature should be 160º. Cornish Game Hen takes up a lot of plate space. These were the first Cornish Game Hens I had cooked in a long time and I had forgot how good they really are. 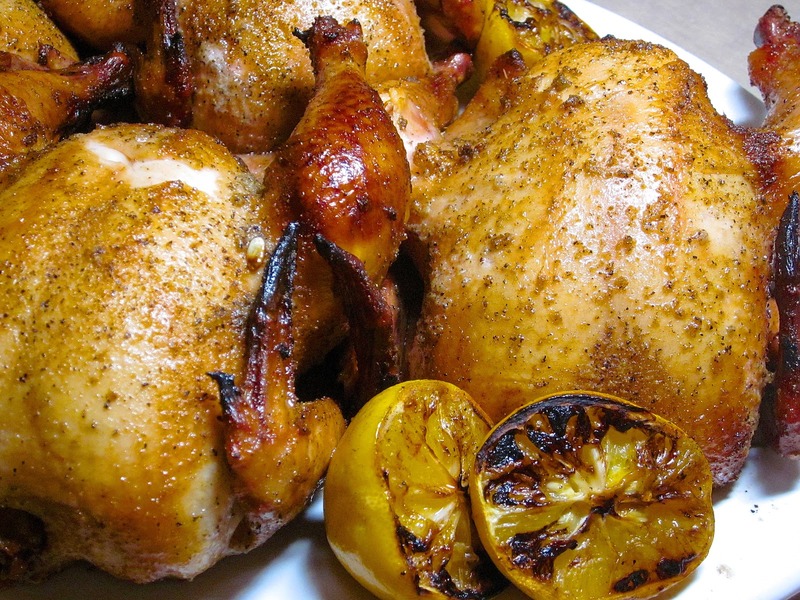 Don’t let their diminutive size fool you; these little birds are rich and very flavorful. The Meyer lemon and green chile rub was the perfect seasoning combination. 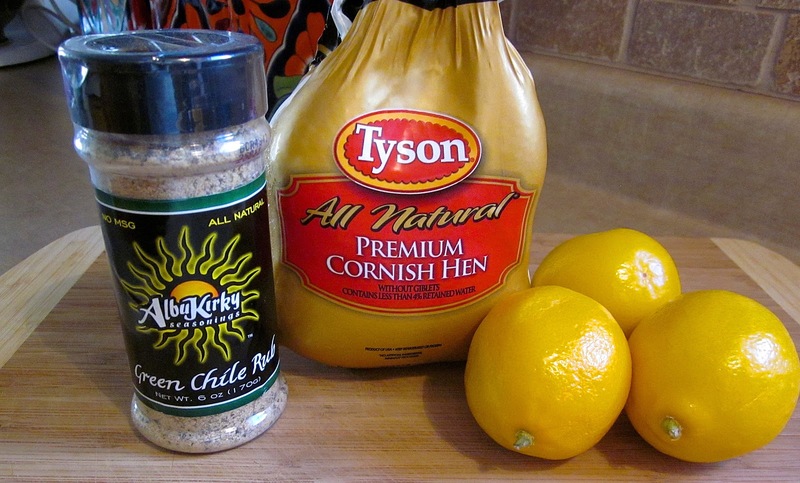 The lemons added a light citrus flavor that really complemented the flavors of the green chile rub. They were spectacular and I’m definitey going to be cooking a lot more Cornish Game Hens this year! 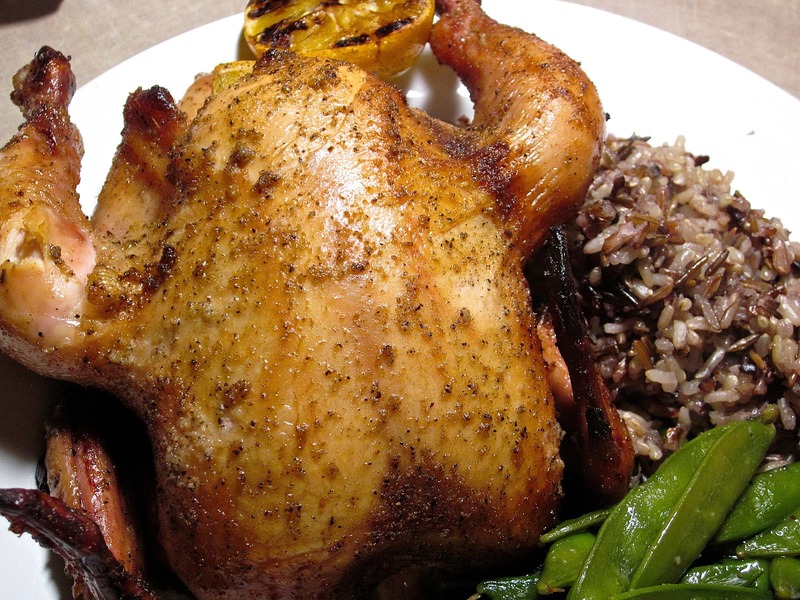 Oh boy, you have me wanting to revisit a cornish hen recipe that I haven't had in years! These look great and I know that green chile rub kicked it up. I'll be watching for your Cornish Hen recipe, Chris.